The Neuroguard IEP 3-in-1 System is the only complete carotid stenting system on one catheter. The Neuroguard IEP Carotid Post-Dilation Balloon System with Integrated Embolic Protection contains a novel nitinol stent, an angioplasty balloon and an integrated 40-μm filter designed to provide added protection during the entire procedure. The Neuroguard stent has a closed-cell design intended for optimal balance of radial strength and flexibility. The stent is flared at both ends to facilitate wall opposition in tortuous anatomy. The integrated 40-μm filter results in the ability to capture both macro- and micro-emboli. The Neuroguard IEP 3-in-1 Carotid Stent and Post-Dilation Balloon System with Integrated Embolic Protection is intended to improve the carotid luminal diameter in patients with clinically significant carotid artery stenosis and for the simultaneous capture and removal of embolic material during angioplasty and stenting. 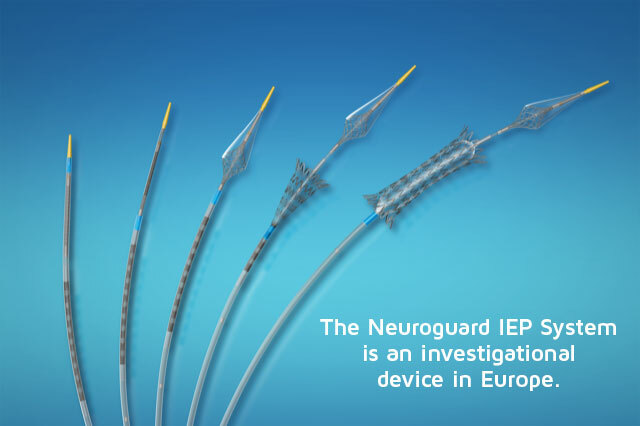 The Neuroguard IEP System is an investigational device in Europe. Not commercially available, worldwide.